This three-ingredient marinade has to be the easiest and yet most tasty one I have ever made. It consists of equal parts sour cream to harissa paste, plus some smoked paprika. If you don’t have any harissa in your house, I suggest you jump on the bandwagon quick smart because it somehow ups the fanciness factor of any dish with the most minimal of efforts (spoon in jar – spoon out of jar – et voila!). I let the chicken marinate in the sauce while I prepare the vegetables, and then pop it in the oven for 50 minutes and out comes a healthy and hearty dish that is positively packed with flavour. Whilst I turned it into a whole meal casserole, the marinade also works brilliantly if you are short on time and just want to grill a piece of chicken instead. And whilst we are clearly not vegetarian, that doesn’t mean that the veggies are only there to play a small supporting role. Oh no! They have an equally important part in this dish as it is positively loaded with a rainbow of brightly coloured veggies, providing all five of your five-a-day (or is it actually ten a day now?!). That means that this dinner provides a massive 159% and 79% of my daily Vitamin C and A requirements respectively. The high antioxidant vitamin content makes it a wonderful immune booster, which is not what you would normally associate with a hearty chicken casserole. I also love to make a double batch of this, par cook it and then pop it in the freezer once it has cooled. This means I have an entire meal to hand, and one that is particularly excellent if I am entertaining. I do hate to have friends over and be tied to the kitchen, tending to multiple dishes on the hob. It is so much easier to just put something in the oven and forget about it! And this is suitably delicious enough that you will earn gasps of awe! One portion provides 494 calories, 41g of protein, 6g of fibre, as well as a ton of micronutrients from the vegetables. · Pre-heat the oven to 180 degrees. · In a small bowl, mix together the sour cream, harissa paste and smoked paprika. Season with a little salt and fresh black pepper. · Coat the chicken (skin side down) in the marinade and pop back in the fridge while you prepare the vegetables. · Chop all of the vegetables into bite sized cubes and peel the garlic cloves. · If you have a cast iron casserole dish, you can sauté the vegetables in the same pot as you will be putting in the oven. Otherwise, use a separate frying pan and roasting tray instead. · Heat a little oil (in the casserole dish or frying pan) and sauté the vegetables until just starting to brown. · Remove the chicken from the fridge and shake off the excess marinade. · Add the chicken skin side down to the pan and brown for a few minutes. · Remove from the heat. · Mix the vegetable stock with the remaining harissa mixture that was marinating the chicken. Combine well. 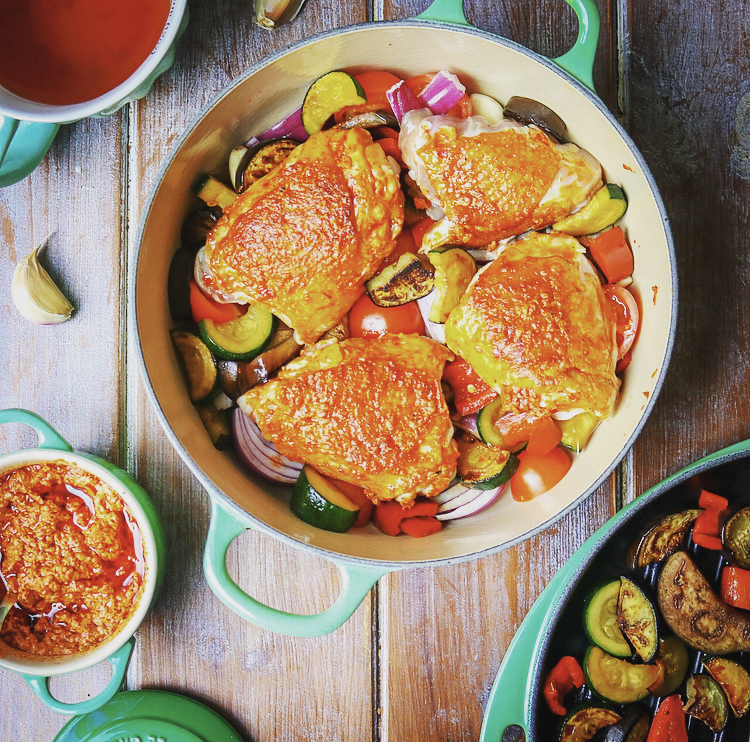 · If using a cast iron casserole dish, simply pour the mixed harissa stock over the vegetables and chicken, put the lid on and pop in the oven. · If you don’t have a casserole dish, then transfer the sautéed vegetables and browned chicken to a roasting tray, pour over the harissa stock, cover with tin foil and pop in the oven. · Cook for 40-55 minutes depending on the size of the chicken pieces used. Make sure the chicken’s juices run clear and that is fully cooked. · Optional – 10 minutes before the end of cooking, add a pre-cooked grain pouch (like spelt, wholegrain rice, freekah or quinoa) to the dish and stir through.